The Metropolitan Council is the regional planning agency for the seven-county Twin Cities metropolitan area. One area in which the Metropolitan Council plays an important role is in the region's transportation system. A second agency with a regional focus is the Minnesota Department of Transportation (Mn/DOT). Like highways, transit needs to have a plan to guide infrastructure investments so the funds available can be used in a cost-effective manner. 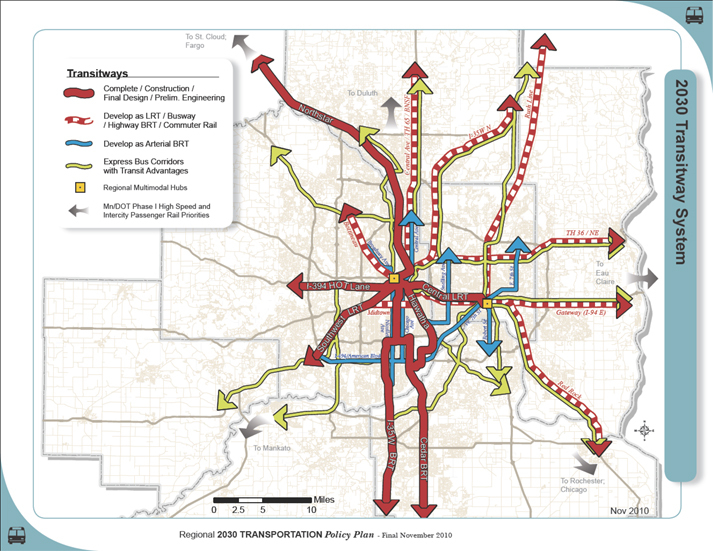 Two documents that guide the decision making process are the Metropolitan Council 2030 Transportation Policy Plan and Mn/DOT Freight and Passenger Rail Plan. Trains run on existing freight rail tracks and are powered by either a diesel or electric locomotive. Commuter rail service is designed for longer distance commuter trips with station stops every three to five miles. Due to the long distances and high speeds of travel, commuter rail focuses on providing every passenger with a seat and trains are equipped with amenities like tables, power outlets, and restrooms. Commuter rail scheduling is focused on the morning and evening rush hours with trains typically scheduled every 30 minutes. Light rail transit can operate on dedicated right-of-way, or within the existing street network and its exceptional flexibility provides it with the ability to transport high numbers of commuters comfortably, efficiently, and quietly. The power supply for LRT trains comes from overhead electrical lines, which make them clean and quiet. LRT provides more frequent stops, on average one per mile, than commuter rail and because of this, LRT and commuter rail serve different markets even if they share a corridor. LRT station designs incorporate access by pedestrians, passenger drop-off, and reconfigured bus connections. Many suburban stations offer patrons the option to park-and-ride. Whereas LRT and commuter rail require their own right-of-way, Bus Rapid Transit (BRT) is more flexible since buses can run on the existing streets. At a minimum, BRT systems offer bus priority on mixed traffic streets and at a maximum offer a completely separate right-of-way for buses. Most systems fall in the middle, which allows for faster service, the ability to carry more passengers, and improved fare collection compared to conventional bus service. It also allows for service to be provided to a broader service area. High-speed rail refers to a series of technologies involving trains traveling at top speeds of 90 (steel-wheel) to 300 (magnetic levitation) mph. High-speed rail is time-competitive with air and/or auto for travel markets in the approximate range of 100 to 500 miles. As opposed to commuter rail, high-speed rail corridors are typically used for interstate and city transportation. Multi-modal transportation hubs are typically located in urban centers and act as a nucleus for multiple types of transportation including commuter rail, LRT, BRT, bicycles, pedestrians, taxi cabs, tour buses, and high-speed rail. The Twin Cities is currently planning two hubs, one in St. Paul and one in Minneapolis at the Union Depot and Interchange, respectively.